We had decided that we would stroll a little further yesterday in order to make today’s stroll a little shorter. It was just as well that we did make yesterday’s stroll a bit longer as it turned out. We set off today in a reflective mood as it has been just over four months since we set off from Gravels Bank, in the snow, with little idea of what lay ahead and today we would cross the order into Italy. 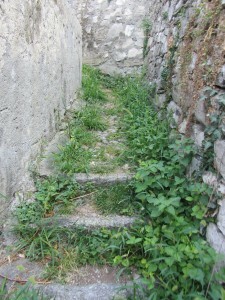 The path started with a nice flight of steps just past a lovely row of cottages…. Having climbed up to the path it turned into a very nice flattish section of asphalt on which we could stroll along without much effort. Today’s stroll was turning out just as we had expected that it would. It is quite astonishing to be walking along a quiet leafy rural lane in complete tranquillity yet, as one can see on the map, there is industry and a motorway only a few hundred yards away. The sun was getting hotter and hotter and we began to think about getting some lunch. We had not made a picnic as we were to be passing through villages where we would eat. Until today the path signs have been very good indeed. I may have mentioned the odd shortcoming on occasion but navigation has not been too difficult but today navigation was a nightmare. There were very few signs to be seen and the places mentioned on the signs were of no use. We seemed to be wandering around in a haphazard manner and I was becoming very hungry and, hard to believe I know, quite irritable. 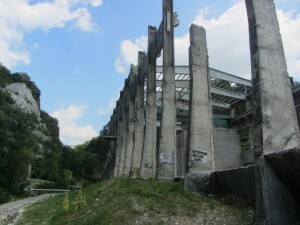 We found a path going in, more less, the right direction and followed it downwards into a huge rocky basin in which was the enormous concrete skeleton of something industrial. It was here that we ate the few crisps we had and some slices of cheese. Fortified to some extent we ploughed onwards. 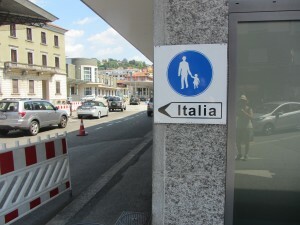 We still were short of Chiasso and the Italian border and beginning to flag. 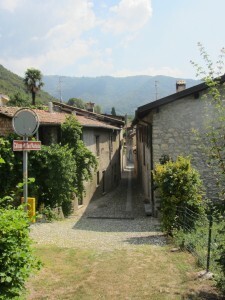 We eventually found our way down into Chiasso, the last town in Ticino, and the frontier with Italy. 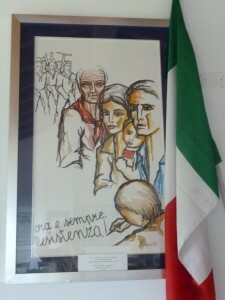 We were quite excited to be passing through the customs post and to step onto Italian soil. As it had been at Basel, we weren’t asked for a passport, or had our belongings searched we just strolled on through. 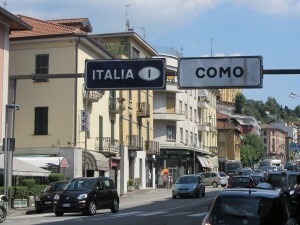 Now we were over the border and could make our way to our place of rest in Como. There was to be no choice as to which way to go so we followed the main road. 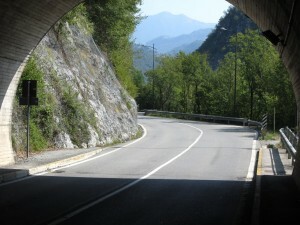 After a while we deviated from the main road in order to find a quieter and more pleasant road. Usually we get this sort of thing right but this time we got it wrong. The road was bendy, narrow and had no pavement. The road also had lots of traffic moving at quite a speed. the motorists must have though that we were totally mad to be on such a road. In order to give the drivers a sporting chance at missing us I held out my hand waving my straw hat. We did pass the lake and it looked fabulous through the trees when we found the courage to look away from the road. Janet had organised the hotel and had taken the precaution of writing down its name and also had drawn a sketch map. Once we had got into Como it took just a few minutes to find our bed. I am writing this with my feet soaking nicely in the bidet. It is very hard to believe that we have made it to Italy although we still have a long way to go before we have done strolling. 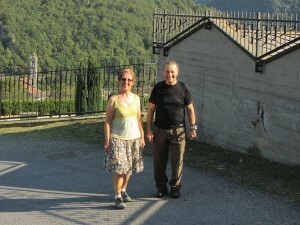 Having arrived in Italy we needed to know how we should tackle the next few strolls which would get us to the end. We had no maps and no inkling of footpaths and of way marking. 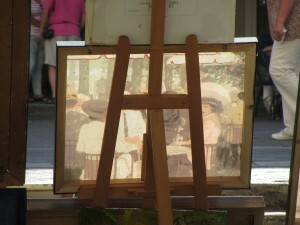 As I was eating an ice cream in the shade of the cathedral I noticed that I could see a painting from the back. We started the day with a long lie in and only got up at 8:30 in order to get breakfast before it was cleared away. 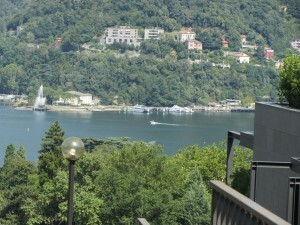 Como looked very special in the morning sun as we strolled around taking in the touristy bits. 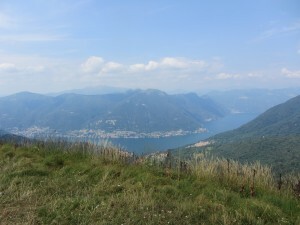 Then it was down to work, find maps and work out how we were going to overcome the mountains in between Como and Bagolino. 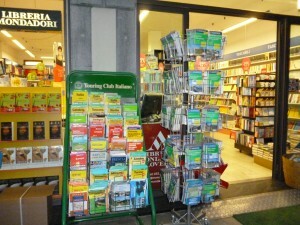 The tourist information office pointed us towards the map shops and also to the pharmacy for foot care products. 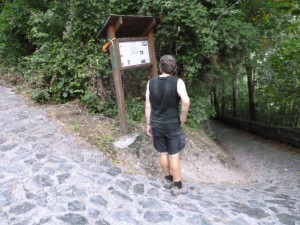 We ate a spartan lunch and had a crack at working out a route. In the end there are two possibilities, go long and high or go low and not so far. At the moment long and high is winning as it means that the views will be better, the air will be loads cooler and we shall be away from traffic. The downside of this solution is that the will take longer and need greater navigation skills. We had decided to have a day of rest today but after a long afternoon sleep we thought that an evening stroll would be just the job. It would also test out our map and the waymarkings we should be using over the next weeks. 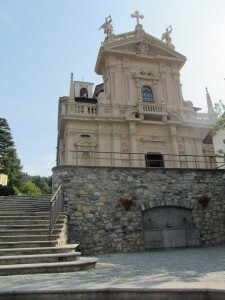 A short stroll up to Brunate could be enjoyed followed by a trip back down on the funicular railway then dinner. 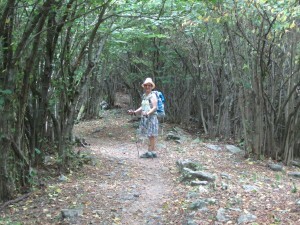 With some assistance from locals we found the path up to Brunate. 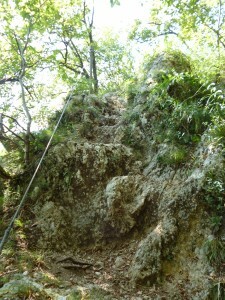 It was a stiff climb but not very different from others which we have done lately. At the top we found the funicular railway station and discovered that the ticket office was shut. We were a little nonplussed by this revelation at first. A helpful notice told us where tickets could be purchased out of hours. One of the bars was shut so we strolled to another, not mentioned on the list, in order to get directions. The bloke behind the bar was not helpful in any way but we did spot a policeman who pointed us in the right direction. We enjoyed a pleasant trip down and had a chat about this and that with the other passengers. More or less a success on all counts if you ignore that fact that the delayed ticket down purchase made us too late for supper. Janet wasn’t hungry anyway and I have some beer in the fridge so we are both happy. 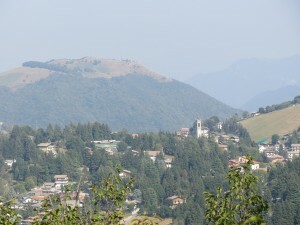 Tomorrow we head towards Erba, an altogether sterner test. Today was a terrific day out on the hill.The weather was just about perfect and there were just one or two steepish bits.As nothing went wrong, and everything was wonderful today, it is difficult to find anything to drone on about this evening. 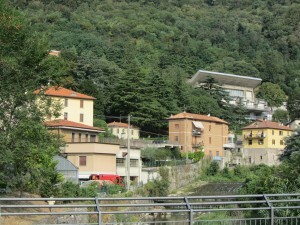 We left from Brunate, a real hill top community with lots of community events going on. Tomorrow we shall have a preparation day in order to prepare for ferragosto, when Italy stops. First proclaimed by the Emperor Augustus in 18 BC the feriae Augusti originally lasted for all or most of August, now it is just one day but as we really want to carry on strolling over this holiday period we need to stock up tomorrow with maps and other long distance strolling materials. Really, the most striking thing about today was the difference in culture between Italy and everywhere else we have visited as we strolled. We noticed at first some mountain bikers whizzing up a hill, but still chatting pleasantly not having the grim fixed faces which we usually see. For runners it was very much the same as they zoomed past on their way up and then back down. The hills were full of strollers out for the afternoon. There were people of all ages, levels of fitness and speed. Most of the people we saw had a purpose for being on the hill, to find a small restaurant, to fly a glider, to have a picnic and most of all to put down a towel and do a bit of sunbathing. Every hill we climbed had a group of people on it doing one or more of these activities. We even saw an ordinary field lower down with loads of cars parked around the edge and people dressed in beach clothes behaving as if they were at the beach or pool side, “how unusual” we thought. In order to complete the last leg of this epic journey we set off this morning to find maps. We found a book shop but no map which we needed. We found a sports shop and had the same story. Another book shop turned up but ts was closed until September. The oddity here is that the map we wanted has Lecco at its centre. It almost seemed as though the map sellers couldn’t understand why anyone would want a hike/bike map of this area. We know that the map exists as it is advertised on the map maker’s web site. 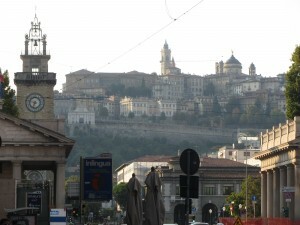 We can stroll tomorrow but may need to go to Bergamo in order to get the pieces which we will need to continue. If the map purchasing failure is removed from the day it has been very nice as we have been able to laze about and get over the all night small motorcycle chorus as the traffic lights changed to green outside our bedroom window, open to let in some night air. 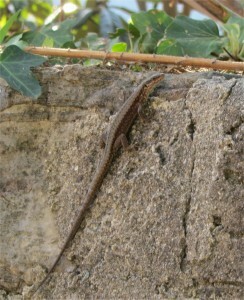 Over the last couple of days we have seen loads and loads of small reptiles darting about on rocks, paths and rustling in the underbrush. These high hills are full of butterflies of all sizes and colours, we are particularly taken by the small dark velvety ones which are everywhere in abundance. Janet seems to has attracted the attention of minute biting things which are also everywhere in abundance,, they are not visible but leave itches behind them. I am feverishly trying to remember what happened yesterday as, due to the blog server failing, I couldn’t write it up before it diminished over the horizon of my fevered brain. At the moment the means by which I add stuff to the blog is running no faster than a snail so what I do remember gets lost before the thing updates, IT people are a pain. 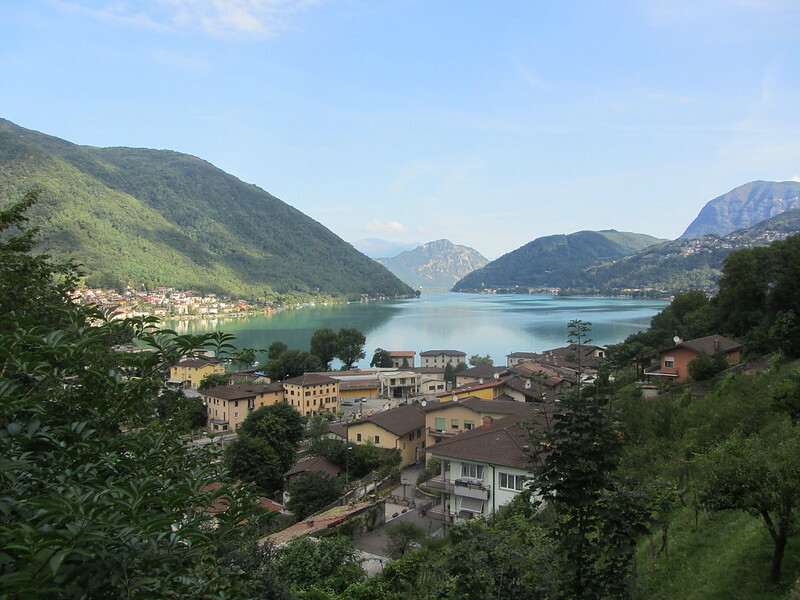 We set off with no real plan of how we were to get from Erba to Lecco as the original plan to follow the low road alongside a busy road, but also a pleasant lake, was revealed to have no actual footpath by it, unlike the map, which showed a footpath clearly using a thick red line. 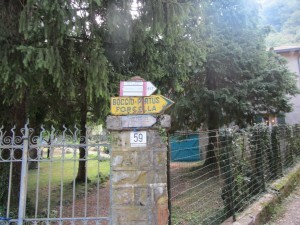 The map of the route will show that we did find a way which avoided roads and gave us fabulous walking country as well. For the most part the going was steepish but not difficult underfoot. At first it appeared that road avoiding tactics had failed but crossing over a pedestrian crossing revealed our first walker’s red and white signpost for the day, pointing to a flight of stone steps leading upwards and in the right direction, but not on the map. Being people who go upwards we went up the stairs, optimistic that it would lead to Castelmarte, the village we were aiming for. The stairs went up and up and up. When we saw the place we were heading towards from below it looked impossibly balanced on a mountain side, on arrival it appeared, as usual, to be quite normally placed. We emerged at the top right in the village, and met an elderly gent’ who gave us some advice about which of the paths would be best for us and who shook our hands when we told him what we were doing in his village. He did say that the views were better up the Eiger and Jungfrau where he used to work. We spent quite a while trying to find the footpath to get out, and eventually were rewarded with another red and white sign pointing to exactly where we wanted to go, and were off down a leafy lane where few cars would go. 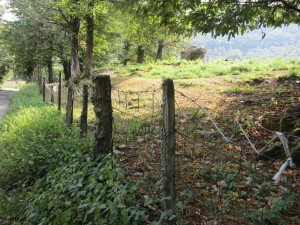 We felt very much at ease by the landscape and were delighted to see fences held together with binder twine, just like at home. We strolled into a small town called Canzo, refreshed ourselves at a bar, and strolled about admiring the charming and historic nature of the architecture before leaving in an uphill direction again. Continuing onwards and upwards we overtook an elderly lady strolling to visit her sister, Janet seemed to think that the sister was 103 years of age, but I’m not sure as the woman telling the tale didn’t look a day over 85 or 86. 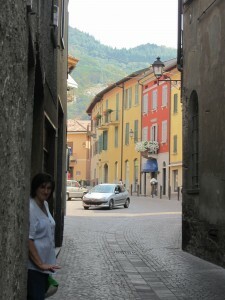 She was very fit, though, as she chatted away to us as we all strolled relentlessly up the hill. 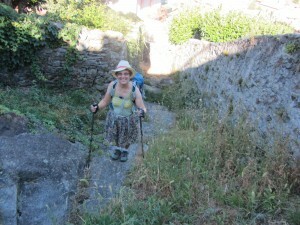 She gave us excellent footpath advice, and knew all about walking in the area. Leaving villages behind and climbing further we found ourselves in a fabulous wood with dappled sunlight and hundreds of butterflies. I have realised that I know absolutely nothing of flora and fauna in these mountains and am really feeling the lack. 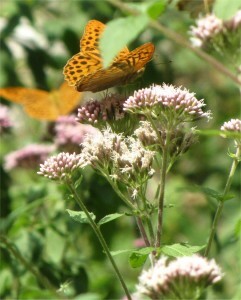 The yellowish butterflies in the photo below were everywhere and seemed to prefer the flowers shown in the photo. Before getting down off the hills we did manage to make one or two mistakes, one where we took advice from a bloke sitting on a rock with two teenage archers in tow. It transpired that he didn’t know any more than we did but, that was our fault for not checking. When one has climbed up and up and up the moment comes when one needs to go down and down and down. This down and down and down was quite tricky in places as the ground was very steep and the soil dry, resembling ball bearings. 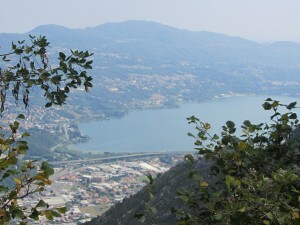 There had been no wide views, even at our highest point, as the mountains were totally tree-covered apart from one or two rocky outcrops, rather Stiperstone-like, but as we came down, we had the occasional glimpse of Lecco and the surrounding country below. 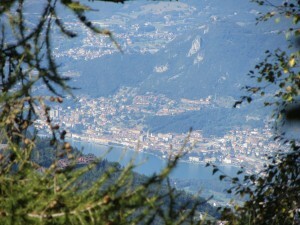 Arriving at Santo Tomaso refuge and chapel we could see Lecco in more detail below us. A few miles to go certainly, but well within sight now. 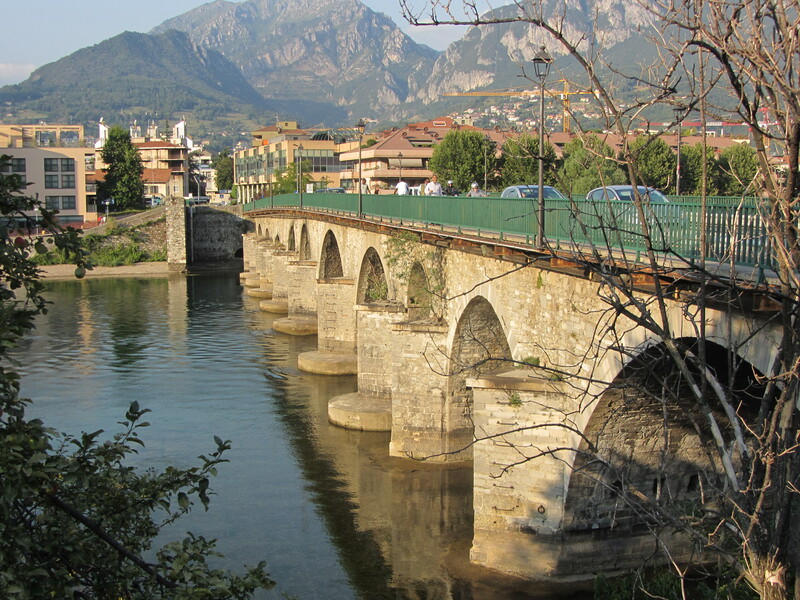 As we strolled over the bridge into Lecco, towards a welcoming beer and bath, we both agreed it had been one of the best days yet. As it is Ferragosto we decided to have a day or two off ourselves. 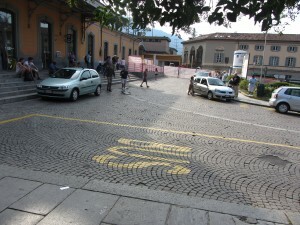 We still need one vital map in order to complete the picture of strolls so came to Bergamo to find it. 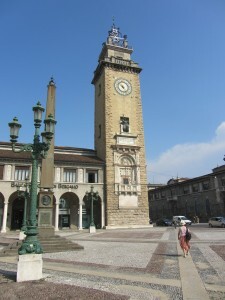 We shall not be strolling through Bergamo so it is a real break from the daily round. We got onto the bus and settled in. An elderly passenger got on and asked the driver if the bus was going to Bergamo, this passenger asked the driver the same question many times throughout our journey. Being a foreigner is really useful sometimes. When this person brought out two crumpled pieces of paper with poems written on them and asked me to read them, I read them, then, when he asked me to buy them, being foreign, I could look puzzled and shrug. Bergamo is as beautiful as I remember it to be. The old high town was full of people this evening, sitting around and chatting, eating ice cream and waiting for a puppet show. There is to be a folk festival next week in Bergamo so if we are in bus distance we might pop along and have a listen. Tomorrow, when we have the elusive map in our grubby fingers, we can work out a route which will include some sort of accommodation. We have a number of 2000 m passes to cross in order to finish the stroll so won’t be able to do many horizontal miles each day. We have some really good stuff to which we can look forward before crossing the finishing line. The day started with some minor excitement as our fellow guests, from Brazil, managed to snap off the key to their bedroom in the lock from the outside. The trusty Swiss Army knife had the very tool to remove the lock cover and prod out the broken piece. Our bedroom key didn’t fit the other lock but the empty bedroom key was just the job and we were able to carry on eating our modest breakfast and our fellows could get their belongings for the day out of their bedroom. After recovering from all the excitement we set off to find the elusive last map. Our first attempt was a total failure as the bookshop was empty of stock and the building available for rent. The second shop was closed and not set to reopen until next week. We were beginning to believe that success would elude us when we noticed a third bookshop with open and welcoming doors. We climbed up the stairway to the map department with dragging steps, anticipating the worst and looking forward to a day devoted to map searches. Expressions of astonishment and relief were written on every part of our bodies capable of expressing these emotions as we spotted the very map at the front of the display. 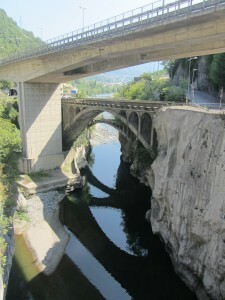 We now have the means to find a way towards Ponte Caffaro. Having a full set of maps does not guarantee success, but improves the chances considerably away from zero. We have enjoyed having a large kitchen in which to cook, sit and plan today. We quite enjoyed washing up and cooking lunch as we haven’t done these mundane acts for ages it seems. Neither of us has had any desire to go out and engage in touristical activities this afternoon and we have slept the sleep of the just instead. Then it was down to business once again. With the maps spread out before us the expected difficulties became more obvious. The mountains and trails run, more or less, north to south and we are moving west to east. All of the ‘easier’ routes would take us along very busy, bendy roads with no pavements.At least one of the obvious routes, which are away from all traffic, appears to involve ladders. Janet isn’t too keen on using ladders so we shall probably try to avoid them, if possible. The final obstacle which needs to be overcome is to find a route which has a good start and end place. We have found routes which look OK but these are edging towards being too long for one day’s stroll in this terrain, as strolling here in twilight would need to be slow in order to avoid falling. Having eaten and watered ourselves heartily, we are ready for tomorrow and the next stroll. The great stroll continued today after a few days of semi rest. As we were only intending to have a short stroll of about 10 miles today we didn’t start particularly early. The morning was cloudy with mist hanging over the mountains. The temperature was somewhere near 25C but not too hot to handle. 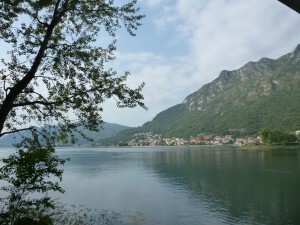 We set off down the lake side from Lecco and were very grateful that the cycle path, shown on the map, existed on the ground. Not all of the lake side was beautiful but people had already set up for the day on the shingle with beach umbrellas and loungers. The stroll down the lake was very enjoyable, improved by a brioche and a glass of water. 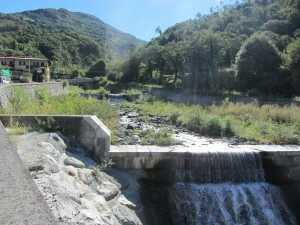 Arriving at Calolziocorte we found a fountain. Before setting off upwards we had some lunch sitting by the fountain with our drinks chilling nicely. We were to find that none of the paths we needed for today’s stroll had been marked by signs or by paint so we needed to do quite a lot of proper navigation. One path had mysteriously turned into a road, which was confusing. 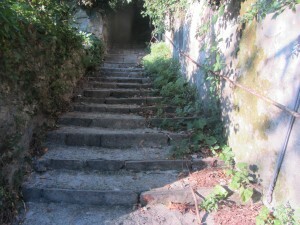 We spotted a crumbling set of stone steps leading upwards and, more or less, in the right place. The steps were overgrown and nettled but I thought it was worth a try. In the end we had to give up as we were overgrown and nettled and someone had dumped a huge pile of earth where earth shouldn’t have been. nothing for it but to retrace our steps and try somewhere else. The sun became hotter as the day wore on and we wore out. 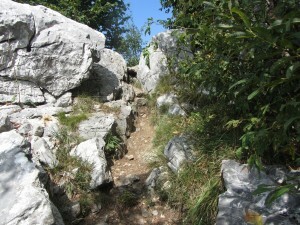 Thankfully, the unnamed path to our destination existed and, although steep, gave us no trouble at all. When we returned to our place of rest the land lady had left a note on our door to the effect that we must pack our belonging and relocate. I rang our land lady, who gave us a garbled reason for the move, plus assurances that the new place was loads better than the old. Our new place of residence looks like a private apartment, although there is another chap staying in one of the bedrooms. The kitchen is not well appointed in terms of utensils but I think that it will be a quieter location. All very odd really! Tomorrow we start strolling very early as we have a long stroll to do with lots of up up and much down down with lots of horizontal distance as well. Our new place of residence was certainly more tranquil than the place from which we moved and I slept like an ordinary person last night . The weather here has been warmish for the time of year and we have developed a fan dependency. Fans don’t really cool things down but they do give the illusion that things are not as hot as one thought. 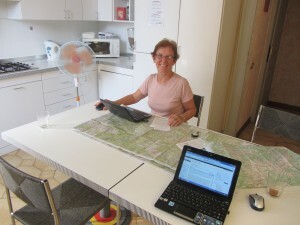 Sadly, the new lodgings have no fan and, in addition, because Janet spotted ants in the kitchen, I thought that I should send an email to our hostess asking for a fan and some assistance with the ants. 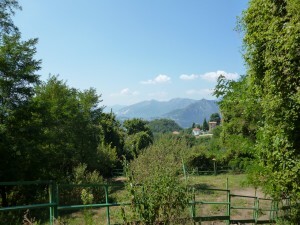 We set off early looking forward to a terrific stroll on the mountains and a cooling fan in our bedroom and no ants in the kitchen when we returned. Today’s stroll was going to be quite long and also fairly tricky in places but it looked as though it would have a high ridge to cross giving huge views down on either side. The climb up to the first top went on a bit, but as we had spotted beforehand that much of today would be above 4,000 ft, we were prepared for it. The experience of yesterday made us a little concerned that the path which we needed would be difficult to find. 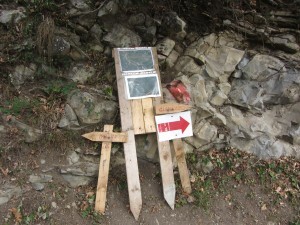 We should not have been concerned as the path was clearly marked and had its own number. 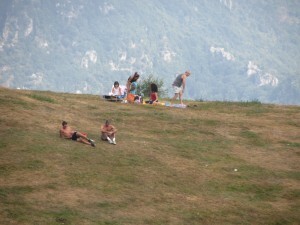 We struggled upwards to the first of today’s summits and found Italian sunbathers already setting up for the day. Feeling pleased with ourselves we enjoyed the stunning views but found the first descent a bit rough. We spent most of today above the 4000 ft mark and found the air pleasantly cool. We had forgotten that the sun was just as strong as it is at sea level and strolled about wiping our brows and other glowing parts of our anatomy without thought. The person proudly standing on the cliff top is gradually turning into a Neapolitan ice cream, red white and brown. We had the intention of strolling for about 20 miles today but our natures got in the way. 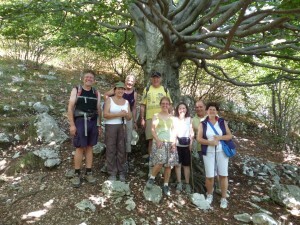 We seemed to find ourselves having a chat with most of the people we passed on the trail. 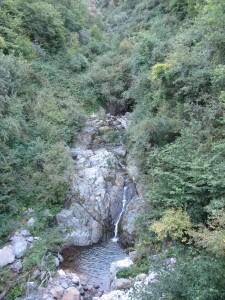 One of the most surprising things today was Chiosco Del Passo Valcava. We emerged from a steep climb covered in moisture and in front of us was a kiosk selling pane and cotechino, drinks, pizza. In addition there were umbrellas under which to relax. 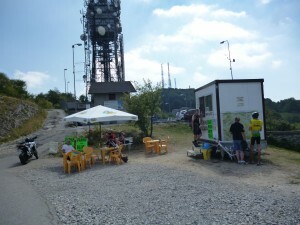 A group of people were enjoying the views, the sun and a cooling drink. After an ice cream and a chat about this and that we were presented with some tee shirts by the owner. 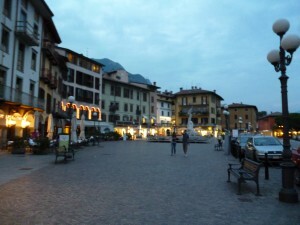 If you find yourself in this part of Italy you must have a drink here. On the way down from the highest points of today’s stroll the going became very difficult. 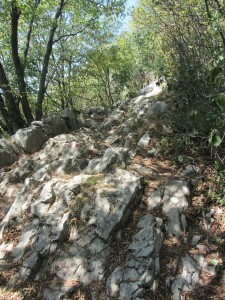 The descent was long and steep with small stones and granules of soil underfoot, plus sections of rocks to negotiate. I was very fortunate to stay upright but Janet slipped over once or twice. She is now so tough that she didn’t feel a thing, thank goodness. 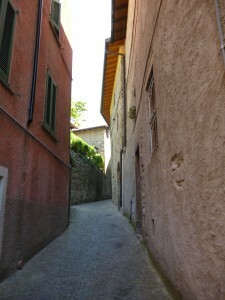 As we descended towards Strozza we could hear voices chatting below us. When we drew level with this jolly party we passed the time of day and discussed Midsummer Murders, amongst other things. We were able to reassure them that the British countryside is as beautiful as shown but far less dangerous. By now we were way off the pace but, we are not in a race after all so we didn’t really care as we had had a great day out and met some lovely people. At Strozza we were running out of steam really. We passed a chap waiting for a bus and asked him if the bus for which he was waiting was going our way. He told us that it was and we decided to eat and catch the bus. We shall now have to catch the bus back in the morning in order to continue strolling. It transpired that our informant was from the Ivory Coast. As we waited for the bus another bloke turned up and we all felt very international as he was from Ghana but had been living in Italy for twenty years. When we returned to our place of rest we found no fan and some ants. A real bonus for us though is that the desperate shortage of lavatory paper is now at an end and we can both relax. Today’s stroll was a real Sunday morning stroll in every sense. We turned up on the bus and continued from where we had left off yesterday. We spotted our Ghanaian acquaintance of yesterday strolling in the other direction and shouted jolly greetings in English across the road to each other. The footpath, for today, appeared to be a ‘dotted line’ footpath. These ‘dotted ilne’ footpaths are usually less comfortable than ‘solid line’ footpaths and we allowed quite a lot of time in case there were difficulties. 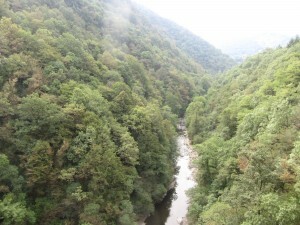 The footbridge across the valley gave a great view of the river, and the gorge through which it passes. Once over the bridge we could see directions for road runners. This notice seemed to suggest that we should be overwhelmed by hordes of earnest racers. We were disappointed when we saw just one person in running kit passing sweatily on his way. The runner looked quite splendid with his long grey hair and long grey beard. It was a really pleasant surprise to find that the path had been transformed into a ‘solid line’ path. The path was flattish and easy. We could see that it had been difficult in the past and were delighted that those days had passed. The path was just a pleasant day’s stroll, perfect for a Sunday morning. We were enclosed by trees and were protected from the ever increasing heat of the sun. The temperature was, apparently, 35C today and will be rising to 37+C as the week goes on. We are delighted to be returning to the high passes once again where we shall feel cooler. Seeing the notice about a lost bunch of keys we wondered if they were ever reunited with their owner. Our map showed us that we could do the final leg of today’s stroll on a cycle path. We now know that a cycle path along a road just means that cyclists might like to go that way. It doesn’t necessarily mean that there is a separate path for cyclists. Today’s cycle path went along a narrow road with no pavement. Hot Sundays encourage Italian motorcyclists to emulate the exploits of Valentino Rossi. One person passed me at high speed but did give me a margin of error of about two feet so we both survived this close encounter. The turbulence from the passing bike felt like a physical blow. A group of people were preparing for an outdoor musical event as we passed on our way through Ubiale. It appeared as though the bar was closed and just offering drinks for the helpers but we asked for a drink anyway and sat under their canopy relaxing and getting ready for the last half mile. As we sat drinking a beer in the bar at Sedrina a bloke spotted the map and asked where we had been etc. We told him that we were going to Selvino tomorrow and he not only told us where we should find the start of the track we should follow but that walking in Austria is loads better than Italy as the paths are better and have more reliable signs. With this powerful endorsement he gave me a sketch map of the route we should take with the lunchtime restaurant clearly marked. This man loved walking and had his priorities firmly in order. Many apologies to anyone who has had a go at reading the daily outpouring from me today. The people who host these pearls of prose have had a few problems with their cloud and intend to blame all incompetence and lack of alternative provision on that. With a bit of luck all will be well very soon. 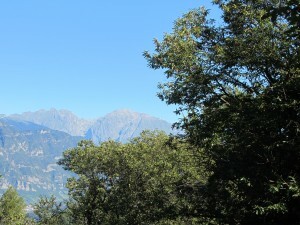 Here in Italy a cloud or two would improve things for farmers and the trees we see each day in the mountains. At half past eleven tonight (Italian time), now in fact, the temp is a cool 31C. We started the day by sipping a cappuccino and a hot chocolate in order to wash down a brioche or two in the bar at Sedrina. As we were finishing the last delicious drops and crumbs the chap we had been chatting to yesterday turned up and, when we were ready to start strolling, came along with us in order to show us where the path began.He kept up a very sprightly pace as we tore up the hill. Wandering about in the woods wasn’t quite as easy as Mario made it seem. 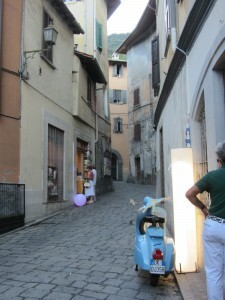 We went this way and that but knew that we needed to find Prati Parini. 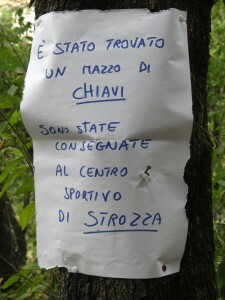 When we saw a sign nailed to a tree saying ‘Prati Parini this way’ we were more than delighted. 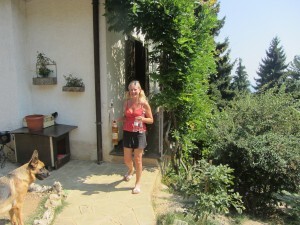 It is still a surprise when we have steamed our way up steep paths and wandered over narrow ledges to arrive at an oasis with shade and cooling drinks. An elderly gentleman was sitting in the shade with a few wasp traps on the table and we drank a coke and chatted with him about the dry weather, which country we came from, local tragedies in the paper and also about an event which took place in 1945 when he was just a 17 year old youth gathering in the hay harvest on the hill. I suppose that, we being British, he felt able to talk about it to us. This event was still very much in his mind, even after all of the years which have passed. 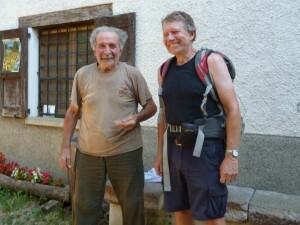 He gave us a lot of good mountain advice as well which helped us enormously on the trail today. We have encountered a few scrambles today but nothing really awkward. even the ledges have been benign with no really silly drops to think about as we made our chatty way over them. The scrambles look fairly tame in this photo so I can’t understand why they took us so long to climb. The heat has been something to write home about today and we were warned by all of the people we met that there was very little water on the hill this year. Arriving at an unknown and unnamed village we were not all sure of our way and had a minor water shortage. We asked a chap if he knew where the footpath went and he called his daughter. His daughter gave us the full chapter and verse of the final part of our stroll and also gave us copious quantities of water and some cold tea. After a few more miles we could see Selvino below. It was a very welcome sight. We finished the non strolling part of the day with a trip on a cable car and a tram ride, perfection. To finish off all of this delight the bus driver wouldn’t take any money for the fare and we are wearing our chioscho tee shirts. Today has been a truly wonderful day in the hills. We needed to do quite a lot of navigation today. I don’t know how we will cope when we know where we are every day and how to get to places without a map and a bearing. Our starting point of Selvino is quite a tourist honeypot and we were quite surprised by the hordes of people wandering about. Before setting out on the stroll we needed some essential supplies, brioches and sun cream. Finding a farmacia for the sun cream was more difficult than we thought that it would be as they are usually on every corner. Clutching our defence against the devouring sun we set out to find a baker. The first baker had a long queue waiting so we moved to the next, same story so nothing for it but to join the queue. Rather than trying to describe the day I have attempted to add a photo gallery of the day. It is a shame that it is impossible to record, in a photo, the smells of the aromatic plants which come to us in the warm breezes, we shall have to do all this again when we forget. The profile of the route shows a continuous down, down, down and it is more tricky than you might think to be going downwards for ages. The sun has had his hat on in Italy for quite some time so we stole away in the early hours this morning in order to get started before the sun had got up. It seemed as though today’s stroll would involve a lot of up and down. It also seemed as though the up and down would involve a few places where some care would be in order. Janet speaking here – I am putting in extracts from my diary for today, as time has gone on, and we had such an exciting descent to Sovere. Today was another scorching hot day, but we set off on our walk at about seven thirty, which was good, as there was a fresh breeze and the sun wasn’t too hot. 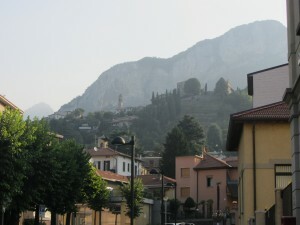 We walked to Colzate and then up a steep hill to some little towns on the other side of the Seriana valley. 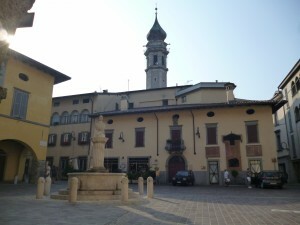 They were very pretty towns, especially Gandino which had an ancient basilica, and it all looked very historical. 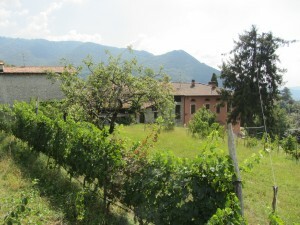 We left Gandino on the correct road, after some advice from locals, who directed us downwards to get on to Valle Piana, which is where we needed to go to get to Sovere. 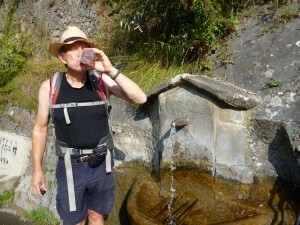 The first thing we found was a fontana at which we refreshed ourselves as well as re-filling our bottles. There was a man drinking from it when we arrived, and then another man arrived on a scooter, and filled up a great water container. We speculated to each other that his mother refused to drink any water that wasn’t from this fontana, which had engraved on it “fonte dei nonni” (fountain of the grandparents). Anyway, the water was delicious. Today was a day of up up up and down down down down. 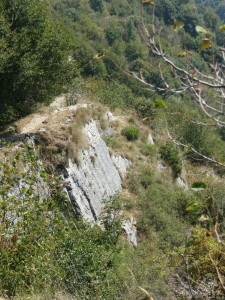 Valle Piana was a narrow valley, tree clad and steep. We followed the sentiero which followed the road to start with, and then it went off on its own path, which was even steeper. We climbed steadily after spraying ourselves with insect repellent – flies and other insects surrounded us unpleasntly within seconds of leaving the road and going into the woods proper. 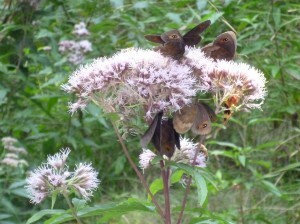 Dark, velvety butterflies that didn’t try to eat us. Once on the road again, we overtook a retired couple and chatted to them for a few minutes before continuing. 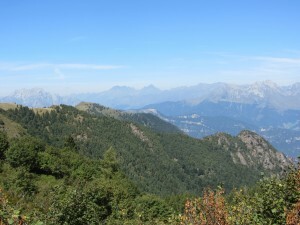 They were going to a malga called Malga Lunga, which was marked on our map as a rifugio with a museum for the resistance (from WWII), which we had thought would be good place to stop for dinner. 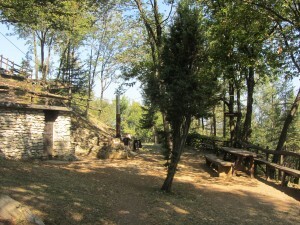 We had our picnic there with fizzy water and beer from the malga, which was paid for by donation. 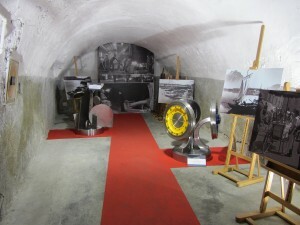 We gave generously, as we had had a good look at the museum as well, which was very interesting. 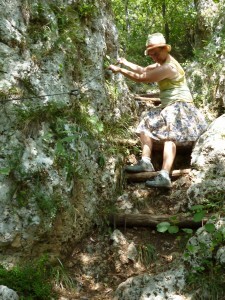 We continued on our way after lunch, going onto a different path – and everything was now down down down in a big way. We made a mistake where there wasn’t a sign, and went up steeply for twenty minutes or so. We realised that it must be totally wrong, and indeed that we might be stranded with cliffs between us and Sovere were we to continue, so we retraced our steps. After that, the down down down was really really steep. So steep in fact that there was a part called a scala (steps, ladder, or staircase) with thick steel wires to hold on to while going down. I preferred it to the other parts that weren’t quite so steep as one could feel confident about not slipping with the wire to hold on to. Eventually we came out of the woods and could see Sovere with Lago d’Iseo behind. 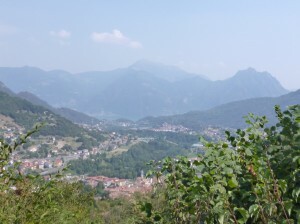 We have now reached Val Camonica – the last valley before Val del Caffaro and Valle Chiese!! We can scarcely believe it. Another extract from my diary coming up for Day 141. Fancy being on Day 141! We are now in Lovere, and in a few minutes we will catch the bus to have a stroll, not too far, we hope to get here officially. It is very, very hot, so we thought we would stroll this evening. This morning, we left the flat where we had been staying very gladly, and then got some walking poles for Mike before leaving Bergamo. 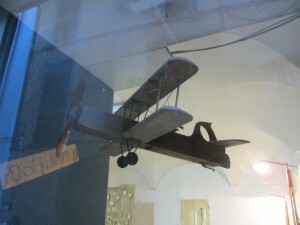 (He had totally broken one of them on the steep descent yesterday, and the other wasn’t in very good condition either.) On our way to the bus station, although knowing the way perfectly well, we had one of our chattery jobs, and coming to ourselves and looking around, realised we were miles out the wrong way. 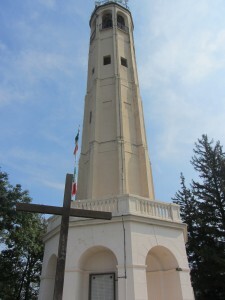 We had crossed Via Papa Giovanni XXIII instead of going down it. Jolly irritating. However, we got the bus which stopped right outside the hotel in Lovere – very convenient. We checked in, and found we had been allocated a bedroom with twin beds across the room from each other – fine for children. The receptionist changed us to a double room (“matrimoniale” in Italian, very descriptive), much more satisfactory, and which, although slightly dark, has air conditioning and a fridge. We are now officially in Lovere. We had a lovely walk, which we hadn’t really been expecting as we thought it might have been on busy roads. 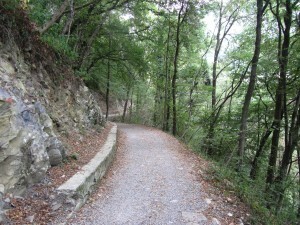 However, we walked along the road to some hairpin bends, and then found footpaths, eventually leading down to the lake, though first going over a little wooded hill – nothing to us by recent standards. So we only walked about four miles or so, I imagine, mostly on footpaths, and very pleasant it was, with it having taken place in the evening. 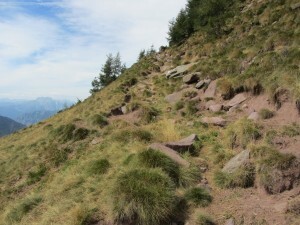 The path down towards Lovere was very steep. 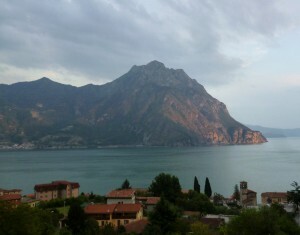 We came down to Castro, and Lago d’Iseo. It was so lovely, I had to add another photograph of the view. 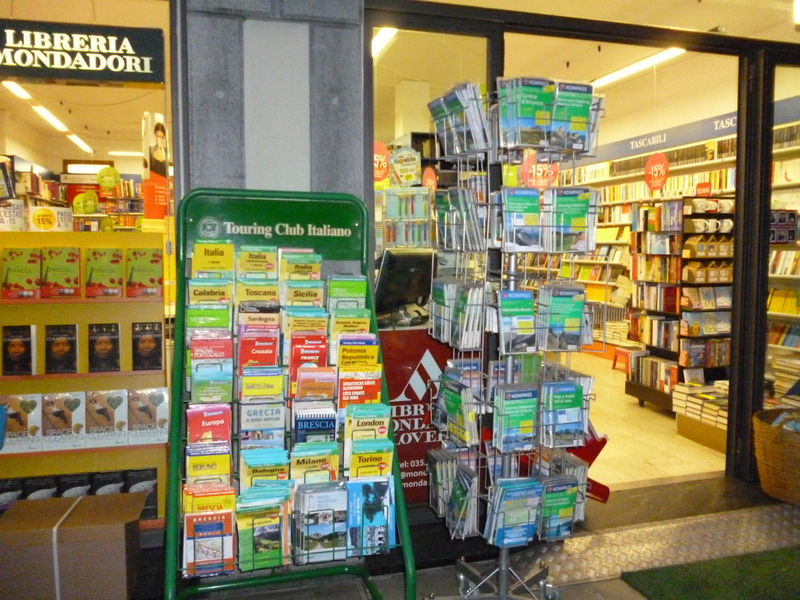 I’ve never seen so many maps for sale in one shop in Italy, and so prominently displayed. Just when we don’t need any more, either. Today has been a strange sort of day in some respects. It has reminded me mildly of the exploits of the Grand Old Duke of York. We awoke early in order to get a good breakfast before setting out for Artogne, the jumping off point for the last leg of the stroll. The breakfast time was clearly set to start at 7:15 and when we arrived an elderly gentleman was setting out a few odds and ends. We bade him a cheery “Buongiorno” but got little response as he continued with his methodical, but stately, progress. Hoping to get away smartly we started to find stuff to eat, a hard boiled egg, some processed cheese, a roll or two and some orange juice. At length the brioches appeared and we ate two of those. We were till invisible to the elderly gent, who continued to bring out tarts, cheeses, cold ham. We were still invisible and left without coffee or tea. The morning air was relatively cool and we made very good initial progress along the lakeside. After a mile or two we were feeling the lack of our early morning pick me up so called in at a bar. As we were sipping we had a chat with the young person in charge. When I went to the loo she asked me what I thought of the four or five portraits of Diana, Princess of Wales which she had hanging on the walls. I made only a muttered reply as she had been kind to us. Refreshed tea, coffee and chat we carried on with new enthusiasm. It was a shame that we were heading in completely the wrong direction. As usual a bout of chatter had broken out and we hadn’t spotted our obvious mistake. We had only strolled half a mile in the wrong direction so all was not lost. Once we found ourselves back on the correct track we also found a cycle way which took us off the busy road and into pleasant countryside. Our map was not the reason for our downfall today but it is woefully out of date we learned, a large road was missing and it now appears that one of the paths we were to use in the hills no longer exists. Artogne proved to be delightful little village and we were pleased to have arrived early in order to find accommodation and somewhere to have lunch. For the last day or two our access to the internet has been difficult otherwise we would have known that there was no accommodation in Artogne. We learned this news from a policeman. He seemed suprised to be asked for tourist information but gave it readily. Somewhat crestfallen we went into a bar and asked where the bus stop to Lovere was to be found. The response that there was no bus to Lovere was disappointing but Janet was fairly certain that, if we walked back to the main road, about half a mile I should think, that we should find a bus stop and perhaps a restaurant for lunch. At the bus stop we realised that there was no bar nor restaurant nor shade and that the next bus was not due to leave for two hours. We retreated to a wall where there was some shade and we had a conference. When I was at work it was always difficult to keep people to the matter in hand, our conferences are always to the point, short and have actions to be taken and a strict timescale for completion. 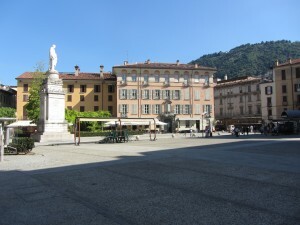 We decided to retrace our steps to Lovere, to eat at the first restaurant with a “pranzo di lavoro” and to have Saturday and Sunday as days of rest in Lovere before setting out once more on the last leg. The heat of the sun was stronger by the time we set off back and it was a pleasure to paddle through the ford we paddled through on our way to Artogne. Finding a restaurant on the edge of Lovere was such a relief. 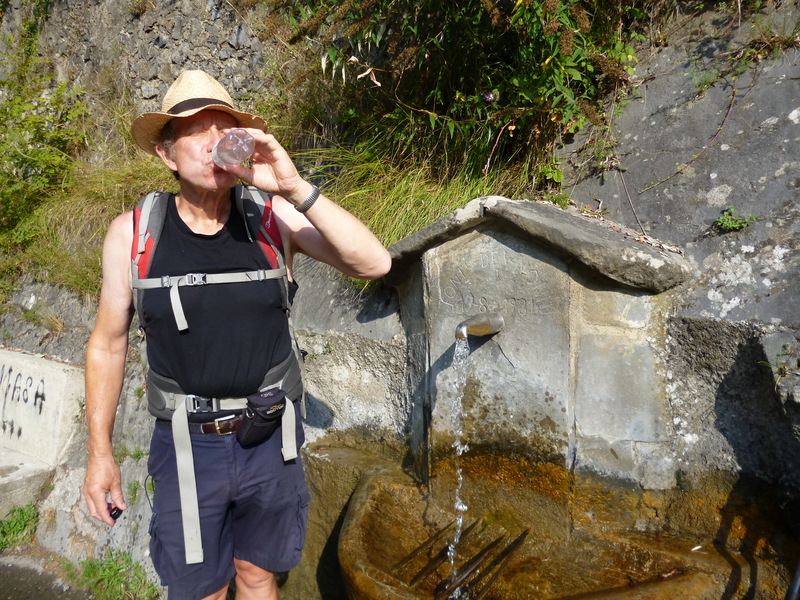 We drank a litre of water each as we ate, not having had any water with us as we had been sure that Artogne would provide. After a long sleep I went out to the mobile phone shop and bought a data SIM for the mifi gadget, no more guesses for us. Janet went and bought a new map, again no more guesses for us. The map shows our first error quite nicely, it doesn’t show the trek back to Lovere though! We are finding it quite hard to believe that we are less than 50 Km from the end of this epic stroll. The map tells us that our route will be much shorter than that taken by cars. Looking at the contour lines on our map and the altitude numbers we can see why this might be. After having listened to another free musical concert this evening we strolled out onto the lake promenade where we could see some people, dressed in yellow tee shirts, putting some rescue dogs through their paces at the water’s edge. The dogs were retrievers and were obviously enjoying fetching balls and plastic tubes which had been thrown into the lake. The game moved up a notch when one of the yellow tee shirted people jumped into the lake and flapped about in a helpless manner. This was looking very dramatic until the dog jumped into the lake as requested but noticed that its ball was still in the water. It did what we both expected that it would do, it fetched its ball and looked for a pat on the head. The chap in the water was obliged to swim ashore with a sheepish grin. We have offloaded some of our stuff onto the postman today, so our packs will be about 5 Kgs lighter in total. We have sent on the electric kettle and Janet’s hot water bottle so it will be bed socks for Janet and no tea or coffee in bed for either of us for the last few days. Tonight we are sitting in a bar trying to get the contact details of the rifugi for the last leg of the stroll. As I mentioned earlier, the ascents rise to over 2000 metres a few times so we need to break the thing into three or four sections.At the moment we have struck a blank but this has happened before so we shall persist until something turns up. We started the day by eating a leisurely breakfast outside and were treated to a march past by an air force band and various local groups with standards. Today is, probably and very hard to believe, the last day of rest before the end of the stroll from Gravels Bank to Ponte Caffaro. Although, finding a place of rest for tomorrow night has become a greater challenge than we had thought it might be. Janet had discovered a possible resting place for tomorrow night and we were expecting an email response from the proprietor. Until we had received the reply we were going to be in limbo and in some difficulty. We did have an alternative place to stay but it was in the ‘wrong’ place and could mean lots of extra strolling and climbing. 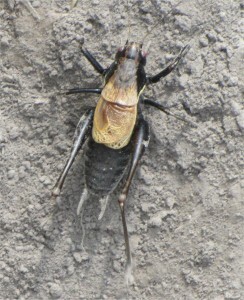 I strolled out to the tourist office after breakfast for some advice about mountain huts and refuges between Lovere and Bagolino, in case we didn’t get a reply, and was presented with a map full of these elusive blighters. One cursory glance at the map was all that we needed to tell us that, where we are going, there is only white space. When the reply arrived from Janet’s email, telling us that there were beds, we were delighted, we can stroll tomorrow and sleep in comfort tomorrow night. We hope that the people with whom we shall stay tomorrow can suggest the following night’s refuge or perhaps a starry sky could be our bedroom ceiling. Having settled our place of rest we could enjoy the promised air show and the rest the day. 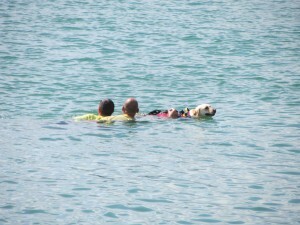 The doggy rescues of yesterday were repeated, with helicopters dropping people into the lake to be rescued. I’m still not sure that the dogs are ready to operate independently though. 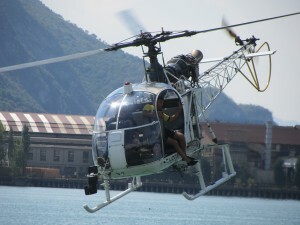 The doggy rescues were followed bya fabulous display of low level aerobatics which took my breath away. 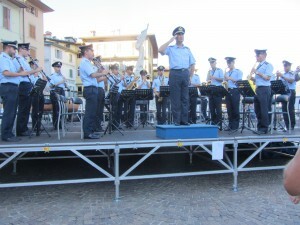 The whole thing was finished with a concert by the band of the Italian Airforce (Milan). I really must learn the words of the Italian National Anthem. One last stroll around and then an early night. Today we have truly surpassed our previous best in the ‘getting lost and wandering about on a mountain’ race. It all started well in that we found the starting place which we had marked on our previous day of failure. We set off up the steep rocky path remarking how light our packs felt after getting rid of the kettle, hot water bottle and other weighty materials. Janet climbing confidently up the wrong path. I casually looked at the GPS, which is not quite as useful now as I have no base mapping and am using a road map, this casual glance suggested that we were going up the wrong side of the valley and of the river. We held a conference and decided to retrace our steps and find the correct starting point. The river which needs to be crossed. I have inserted the map at this point to give a better idea of our day of navigational shame. Having crossed the river and found the new path we headed up and up and up. Arriving at a sign pointing to where we thought e needed to go we changed direction and headed up and up and up. A chap we passed said that going up and up and up was the thing to do, so we did it. 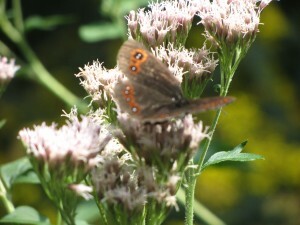 We found a nice meadow and ate a delicious lunch of tomato, grana, bread rolls and other stuff. Setting off from lunch we went up and up as directed and into someone’s private meadow. As there was no path to be seen we zoomed across the meadow in a shifty manner towards a wood. We found a steep bank of soil between us and, we didn’t know what. Scrambling up the soily bank we found ourselves back on a road, but didn’t know which one and where it went. We followed the earlier advice and went upwards. 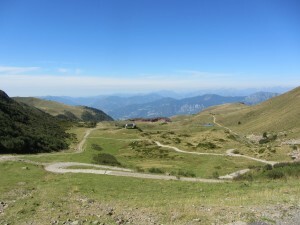 I think that we made a further three fairly big blunders before we got on to an asphalt road, which led to Monte Campione. 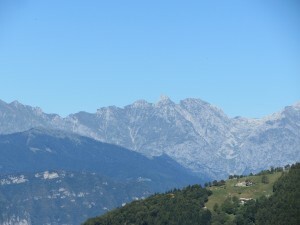 Having arrived in Monte Campione it should have been a piece of cake from now on one would think. I had downloaded the coordinates of our refuge from Google Maps, so no surprises that it was wrong I suppose. 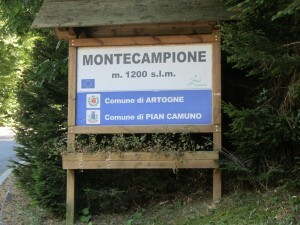 Monte Campione appears to be a ski resort and does not have a centre in the sense that most Italian towns have a centre. 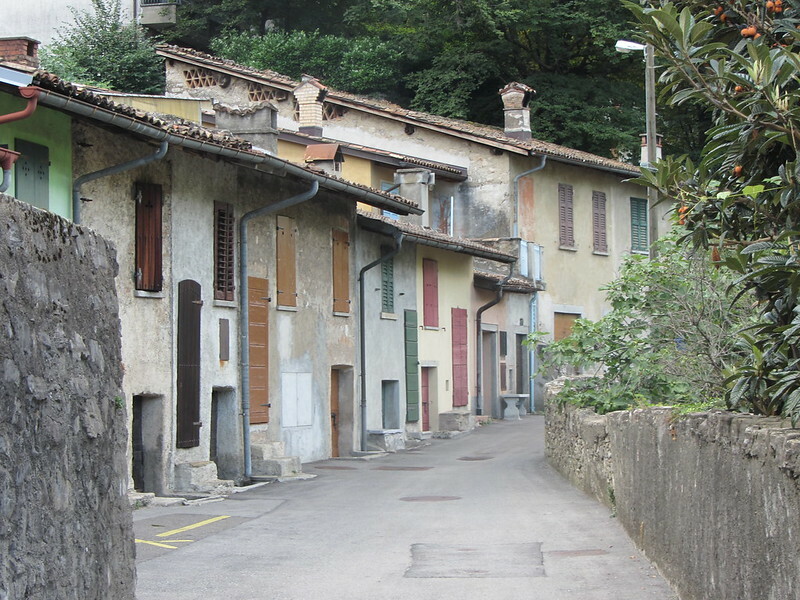 Monte Campione does have poor road signs and lots of similar looking concrete small apartment building. We wandered about a lot, as shown on the map. we asked a few people for directions and they all were very helpful. Had the people we asked been residents I suspect that the helpful advice would have been useful. At last we found ourselves in a holiday complex and asked a bar person for directions. She gave us perfect directions, which we misunderstood almost completely. We passed our place of rest clearly marked bed and breakfast and climbed up and up again to a bar. A jolly group of people were soaking up the sun and drinking aperitifs, they were astonished that we had actually walked from the UK to their bar, after today’s navigation I am quite surprised myself. The waiter pointed downwards to the roof we had passed on the way up and we set off once more. 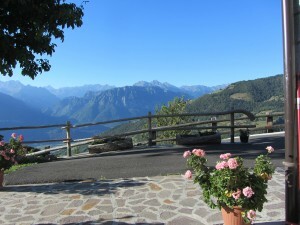 Our host’s husband suggests that we can walk to Passo Maniva tomorrow. He thinks that it will take about six hours. We have learned that if one knows a mountain then it is possible to move as quickly as that. If the paths are marked in some way then even a stranger can move quite quickly if paying proper attention. We think that if the path is not waymarked then we can stroll to Passo Maniva tomorrow but it will take a lot longer than six hours. 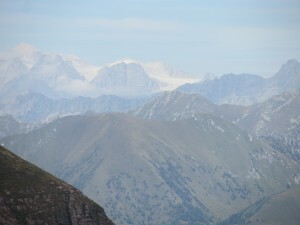 The route appears to rise no more than a further 1000 mtrs and is no more than 2300 mtres at the highest point. It even looks as though it might be flattish on the top so we should get there before it gets dark. So, that’s it really for today. If we don’t need to spend tomorrow night in a hut we could be in Bagolino on Wednesday. There are some tall mountains over there. I hardly know where to start this evening. I can only manage to think of superlatives to describe today’s stroll, so I shall calm down with a cooling beer before pressing the keys . The advice we were given by our host’s husband, that we could do this section of the stroll in one day, was absolutely right. I’m not sure that this would have been true four months ago though. The day started with a steady climb upwards along a winding, bending road. The sun shone brightly and a cool wind cooled our fevered brows as we marched upwards. As we climbed further and further upwards we found ourselves being presented with one last glance backwards to Lago d’Iseo and to Lovere. This one last glance happened several times as the road twisted and turned back on itself and was always a surprise. Once off the beaten track we were actually walking on quite a beaten track. For much of this early part of the stroll we were able to stroll along side by side and arm in arm. I really wish that a photograph could capture the staggering beauty of the mountains in which we have spent today. As I take these photographs I know that they cannot convey what we see but still I snap away. 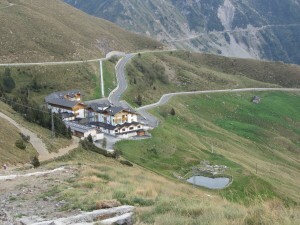 We ate our lunch sitting on rocks below the climb up to the pass of the seven crosses “passo delle sette crocette”. Some of this climb was a scramble but we didn’t need to drop to all fours so it must have been easy really. I’m not really sure if the white stuff on the distant hills is snow or just pale rock. The blighters are high enough to have snow on them but at a distance one can’t really tell. 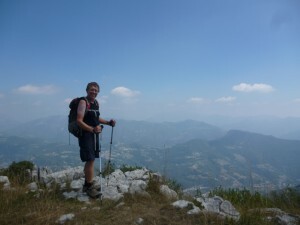 The people we have met on the hill today have needed a bit of convincing that we have strolled from the UK or even that we have strolled from Monte Campione today. They have said something to the effect that this is typical British behaviour. 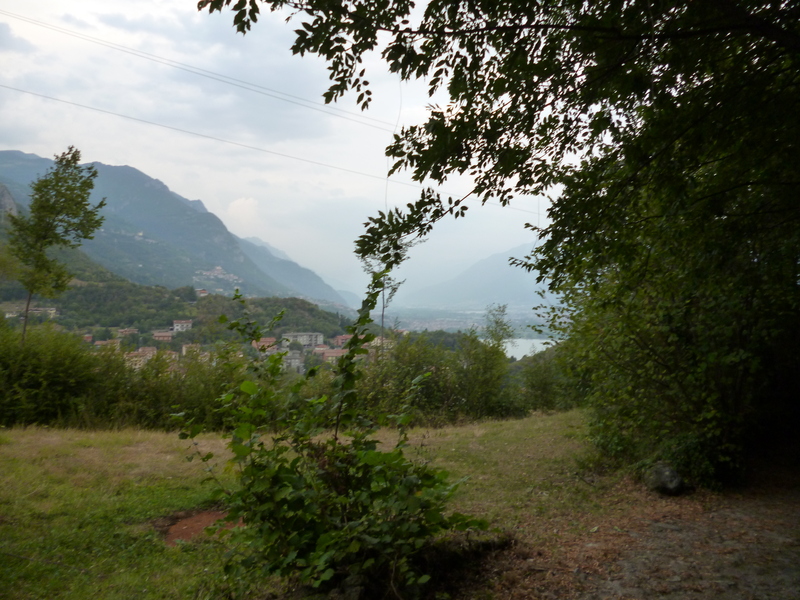 Approaching our resting place for tonight, just before the Passo Maniva, Janet believed that she could see a huge body of water in the distance. I couldn’t see it as water as the light was beginning to fade but she was adamant that it was a lake. What lake could it be, we wondered! 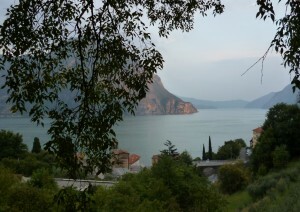 Janet thought that it might be Lago di Garda but, surely not! 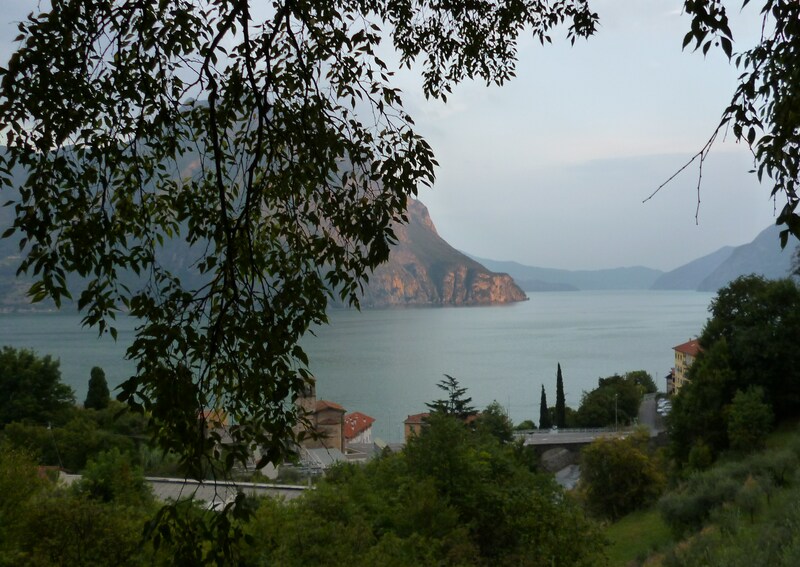 We passed the time of day with a chap doing a circular walk in the hills on our way to the final descent who said that it was indeed Garda. We really are close to home now. Our navigation has been faultless today. The three valley path is really well marked with blue and white painted markings where they are needed. Where special skills might be needed to do a particular section this is well signed. Knowing that we are not going to encounter a nasty descent without equipment gives one a very relaxing sense of wellbeing. The only slight deviation from navigatory perfection was not caused by our inattention to detail but by the construction of a massive ski lift. This structure straddled our path and had no way markings anywhere. This massive structure was not on the map!!! We blundered onward anyway and were delighted when Janet kicked a stone bearing our old friends the blue and white marks painted brightly on it. We have two more days of official strolling left. What to do next?